In power system controls, simplified analytical models are used to represent the dynamics of power system and controller designs are not rigorous with no stability analysis. One reason is because the power systems are complex nonlinear systems which pose difficulty for analysis. This paper presents a feedback linearization based power system stabilizer design for a single machine infinite bus power system. Since practical operating conditions require the magnitude of control signal to be within certain limits, the stability of the control system under control limits is also analyzed. Simulation results under different kinds of operating conditions show that the controller design not only can damp the power system oscillations very well but can also minimize the impact on the terminal voltage. 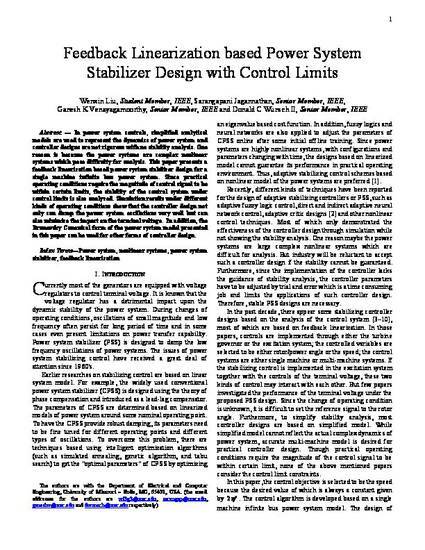 In addition, the Brunovsky Canonical form of the power system model presented in this paper can be used for other forms of controller design.